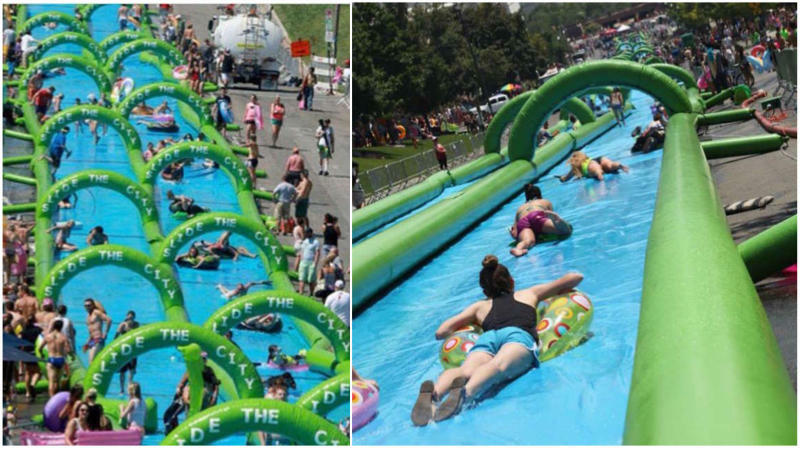 This is the type of water slide that will be installed on Tallahassee's College Avenue for the event. Florida State University's chapter of Alpha Tau Omega is hosting the event, said Chapter President Scott Meskin. Skip Smith succumbed to colon cancer one year ago this month. And this Saturday, Meskin said a huge length of College Avenue will be transformed into a massive water slide in Skip Smith's memory. Meskin said he and the 150 other ATO brothers felt a conventional kind of fund-raising event just wouldn't cut it. This is all to help the Tallahassee office of the American Cancer Society where Tracey Thompson is the senior manager for Community Development. The Cancer Society in Florida, added Thompson, also has Hope Lodges in Tampa and Gainesville with a third under construction in Jacksonville. And then there's a free local transportation service for patients. she said. ATO's Scott Meskin said his fraternity's website has more information and tickets. “Or you can visit: www.tallahasseedowntown.com and click on our ticket link there to purchase tickets,” he said.